Bush: 2004 State of the Union Remix; Obama State Of The Union remix; OBAMA State of the Union Address 2014 - (PARODY); Palin's Breath; Donald Trump's sniffling and heavy breathing; David Cameron's Conservative Party Conference Speech 2012 [Disrupted]; Nigel Farage and Independence day SPOOF! ; Cassetteboy vs The News; Cassetteboy vs The Bloody Apprentice; Jeremy Corbyn's nuclear u-turn and David Cameron's approach to poverty | Cassetteboy remix the news; The Queen responds to Brexit | BREAKING. "plans to remove creative subjects from the UK curriculum are 'short–sighted insanity', according to incoming D&AD president Neville Brody (+ interview). 'The creative industries need high–quality creative graduates. If we're not getting the graduates, we're not going to sustain the industry,' said Brody. 'Creative services as a percentage of GDP is higher here than any other country, so why would you not want to support, promote and build that?'" "Singer Billy Bragg has warned that the government's education reforms risk stifling creativity and leaving the pop charts the preserve of a well–off public school elite. Bragg used a lecture in memory of broadcaster John Peel in Salford to criticise education secretary Michael Gove's plans to scrap GCSEs in favour of an English baccalaureate. He also turned his ire on and 'culture–clogging shows' such as Simon Cowell's The X Factor on ITV1. The singer and leftwing activist said the government's proposed new education system threatened to exclude creative subjects from the core qualifications expected of 16–year–olds. 'At a time of cuts to the education budget, the pressure on schools to dump subjects like music and drama in favour of those that offer high marks in performances tables will only grow,' said Bragg. He criticised the 'insistence that knowledge is more important than creativity', adding: 'As Albert Einstein said, imagination is more important than knowledge, for knowledge is limited while imagination embraces the whole world'. Bragg, delivering the second annual John Peel Lecture at the Radio Festival on Monday, said: 'Under the English baccalaureate, with its reliance on a single end of course exam, the child with the creative imagination will always lose out to the child with the ability to recall knowledge learned by rote." 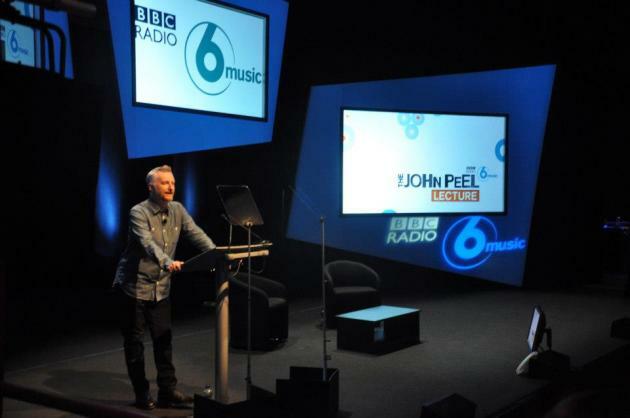 Billy Bragg "John Peel Lecture", photograph: Andrew Stuart/Radio Festival/PR.